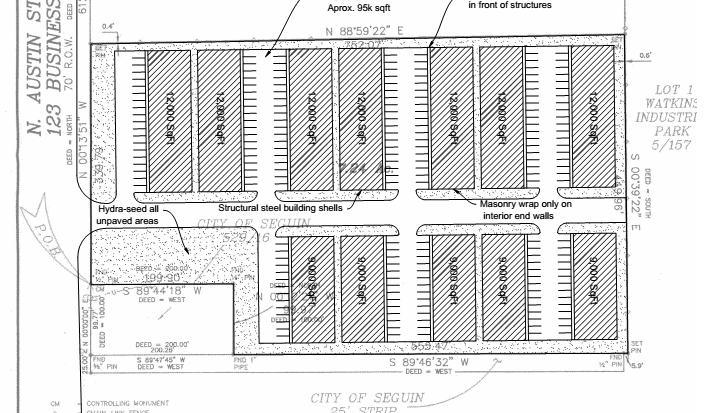 Seguin 7 Light Industrial is an investment package Compass CTX put together to send out to our investor network. As part of our development services we are always out looking for potential investment deals. When we come across a prospective parcel we will put together basic site plans to find the highest and best use. With that information we will generate a Real Estate Investment Analysis report to determine the feasibility of the project. If the numbers are in the range our investors are looking for we will send it out to our network to gauge interest. Once one of our clients is interested in moving forward we will help them through the entire process from due diligence and purchase to construction and property management.